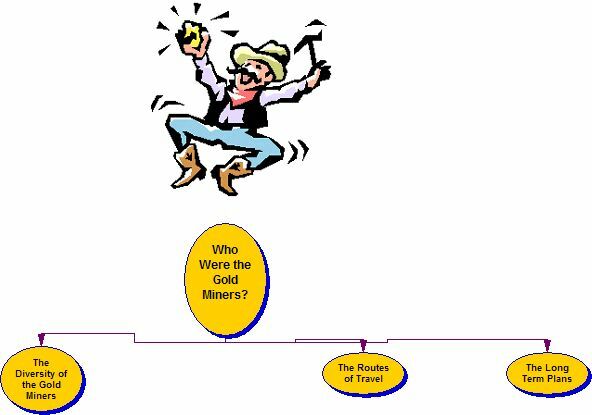 The Web Inquiry Project described below asks students to take on the role of historian, exploring the life of the miners and history of California in the era of the Gold Rush. The following list of questions are intended to have the students really think and contemplate the aspects of the California Gold Rush. What was their background like (culture, race, ethnicity) and where did they come from? What were their long-term plans/intentions in California? What was it like to live as a 49er? What were some of the common diseases or illnesses that the gold miners had to face and what were the effects of some of these illnesses? What were some of the forms of entertainment for the gold miiners? Describe the typical diet of a gold miner? What was life like in the mines? What were some of the various effects of the discovery of gold? 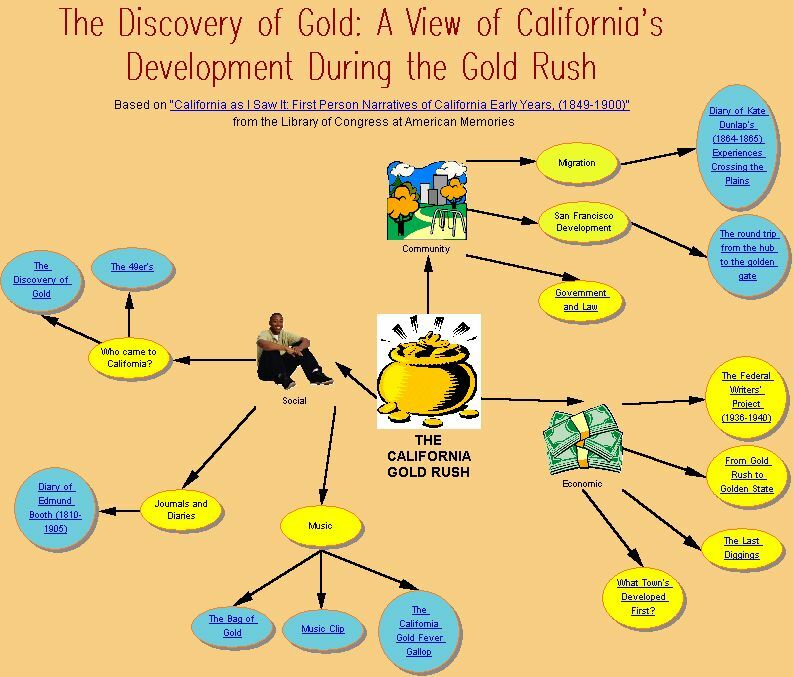 How did the Gold Rush influence California’s statehood? 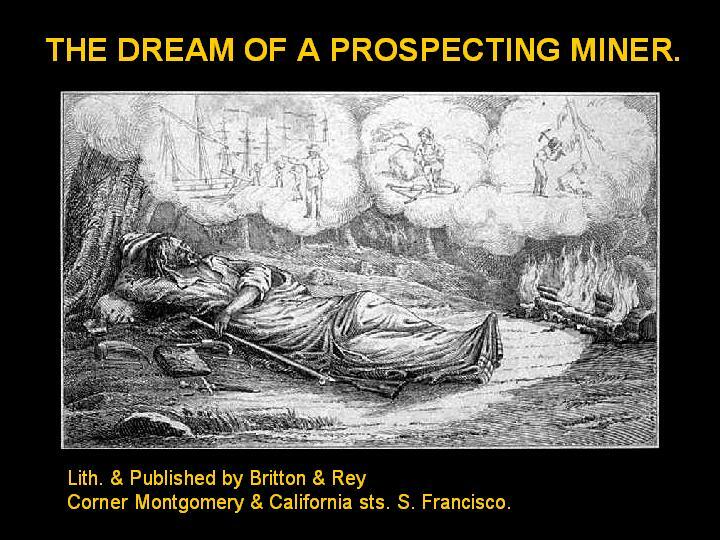 Students will gain a general understanding of the topic through the PowerPoint presentation's links to the American Memory primary resource collection, titled, "America As I Saw It: First Person Narratives of California's Early Years, 1849-1900." If the students browse this collection, they can find letters, diaries, songs, official documents, and other primary resources to get them started. In addition to the resources students will find in the PowerPoint presentation, you will need to provide them with the additional websites with specific information on California's population and the change of the value of money over time. For a more detailed description on these websites and the collection of this data, see the Analysis section. Students using a concept map should continually update the map, adding new information throughout their investigation. Students using spreadsheets and graphs will create these after researching a data-rich Internet site. They should organize the data from the site into a logical sequence and then graph that data to make a visual representation and explanation of the information. Students using KWL charts will begin the chart before the beginning of their research and then revisit it at the conclusion of the investigation. There is often a giant leap from defining the type(s) of data desired and actually finding the data. Providing guidance to students in finding the necessary data is necessary. 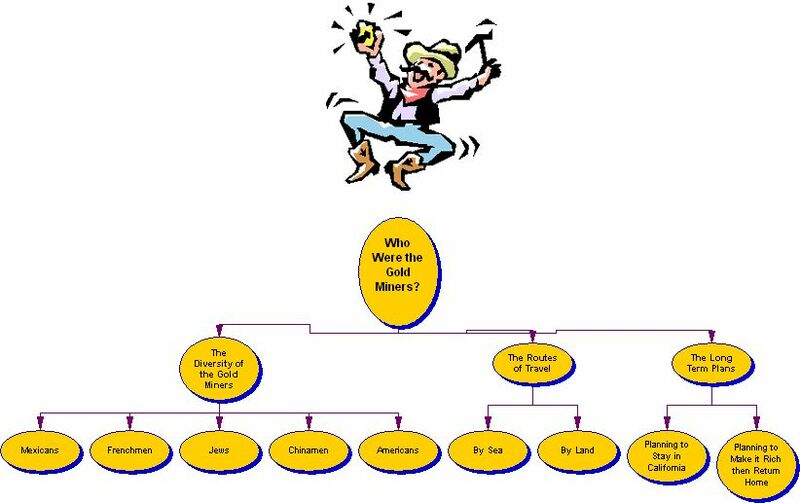 1. Who were the gold miners? 2. What was it like to live as a 49er? 3. What were some of the various effects of the discovery of gold? By using the provided websites, students are expected to present the information in a way that accurately represents what they have learned. This may include the tools listed above or any additional, creative method. Students are expected to explore at their will. Their findings may not represent the samples we have provided, but they need to answer the topical questions. The gold rush was in 1848. What was life like for a gold miner? They used pans to dig for gold. What kind of people were gold miners? Many cultures/ethnicities, both men and women. How much has the price of gold changed? Although the price has had fluctuated it hasn’t changed considerably. Student may also choose to represent their findings in the form of a concept map like the following example. What do you think would have happened to California if the Gold Rush never happened? Would it have developed so quickly? Would explorers continue their westward expansion? Or was the Gold Rush inevitable? Make a crossword puzzle using the facts and vocabulary you have learned.